The departure of SpaceX’s first Crew Dragon from the Station follows five days of docked checkouts of the vehicle as well as removal of the cargo brought up to the ISS inside the capsule and repacking it with a limited amount of supplies for return to Earth. After Crew Dragon was fully packed by NASA astronaut Anne McClain and Canadian Space Agency astronaut David Saint-Jacques, the two crewmembers closed and locked Dragon’s hatch Thursday afternoon, setting up the craft’s departure Friday morning. Per the End Of Mission timeline provided by NASA, the first step in the Crew Dragon’s undocking came 3 hours before physical separation when the Station’s Solar Alpha Rotary Joints (SARJs) on both the port and starboard trusses were locked in place. The SARJs are large rotating gears between the P3/P4 and S3/S4 truss elements that allow the Station’s power generating solar arrays to track the Sun as the Station constantly moves around the Earth in its orbit. The P3/P4 truss (two truss elements built and launched as one) was delivered to the International Space Station on the STS-115 mission of Space Shuttle Atlantis in September 2006. The S3/S4 truss, a mirror of P3/P4, was taken to the Station on the STS-117 mission, also by Atlantis, in June 2007. Locking down the SARJs prevents the Station’s arrays from moving – standard practice when Visiting Vehicles (VVs) approach and depart the Station – and provides a more stable environment for VV navigation systems, which are critical for safe proximity operations between the ISS and its various support craft. After the SARJs were locked down, Anne McClain and David Saint-Jacques aboard the Station, NASA controllers at Mission Control Houston (MCC-H), and SpaceX controllers at MCC-X performed final system preparations for undocking. A “Ready to undock” status came from the Station, MCC-H, and MCC-X around 02:07 EST (0707 UTC), about 24 minutes prior to physical separation of Crew Dragon. The Station then entered an orbital daytime pass beginning at 02:15 EST (0715 UTC); the “Go/No Go for Departure” call came shortly thereafter. 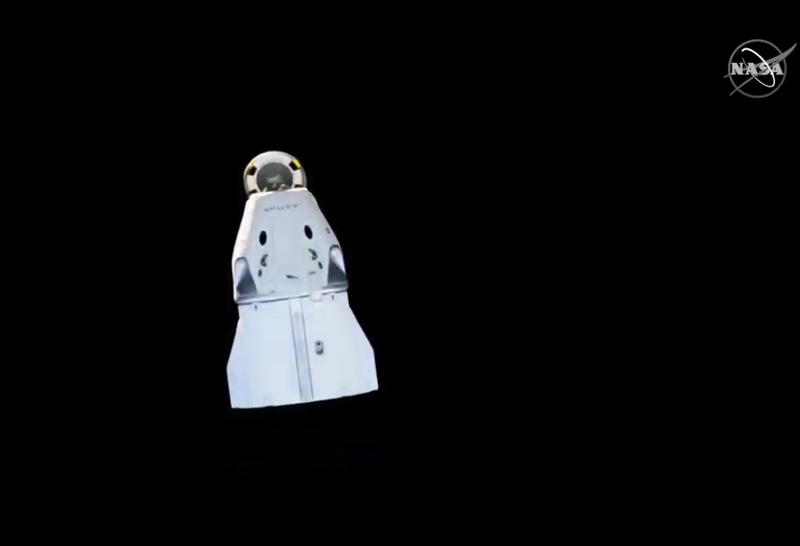 Crew Dragon’s undocking window opened at 02:27 EST (0727 UTC). From here, undocking timelines generally run earlier than the published timeline by up to several minutes. What follows is the published timeline of events and, while the exact times will vary, it nonetheless provides good insight into the timing separation of the various events and how quickly they will occur. Unlike the current Soyuz and Progress vehicles and the Space Shuttle of the past, Crew Dragon did not undock from the Station using springs to physically separate and push it away from the outpost. Instead, the hooks hard docking Crew Dragon to the International Docking Adapter (IDA) on the end of the Pressurized Mating Adapter on the front of Node-2 Harmony released in two groups, “unhook group 1” and “unhook group 2”. Once the hooks in group 2 were released, Crew Dragon was no longer attached to the International Space Station but was still physically connected to the outpost. Crew Dragon then conducted what is known as “undock burn 1”, a 1.5 second pulse of her thrusters to impart a 0.15 m/s velocity difference between it and the Station. This thruster firing produced the physical separation between Crew Dragon and the International Space Station and will, according to NASA and SpaceX, be the moment of official undocking from the outpost. About 40 seconds later, “undock burn 2” occurred, another 1.5 second thruster firing to impart an additional 0.15 m/s velocity change between Crew Dragon and the Station. This was followed by “depart 0 burn”, which will provide a further 0.35 m/s velocity change and bring Crew Dragon’s separation rate from the Station to 0.65 m/s. Crew Dragon passed the 150 m point from the Station 4 minutes 36 seconds after physical separation, after which she performed the “depart 1 burn” – giving the craft another 0.6 m/s velocity change and increasing its rate of departure to 1.25 m/s. DM-1 Dragon exited the Keep Out Sphere around the Station 6 minutes 48 seconds after undocking and then exited the Approach Ellipsoid 17 minutes after undocking. Crew Dragon then reoriented itself 46 minutes after departure for the “depart 2 burn”. This burn occurred 53 minutes 25 seconds after undocking and lowered DM-1 Dragon’s orbit below that of the Station’s to begin setting the craft up for deorbit. A “depart 3 burn” followed 1 hour 39 minutes 45 seconds after departing Station (at roughly 04:11:08 EST – or 0911:08 UTC) and placed Crew Dragon in the correct orbit for its deorbit burn. Crew Dragon’s deorbit process began at 07:48 (1248 UTC) when the craft separated from its trunk and power-generating solar panels. At this point, the DM-1 Dragon relied on its batteries to provide power through deorbit, reentry, and splashdown. After truck separation, Crew Dragon changed its orientation, aligning its thrusters to fire retrograde – against its direction of travel. The deorbit burn, a firing of Crew Dragon’s thrusters, began at 07:53:04 EST (1253:04 UTC) and lasted 15 minutes 20 seconds. 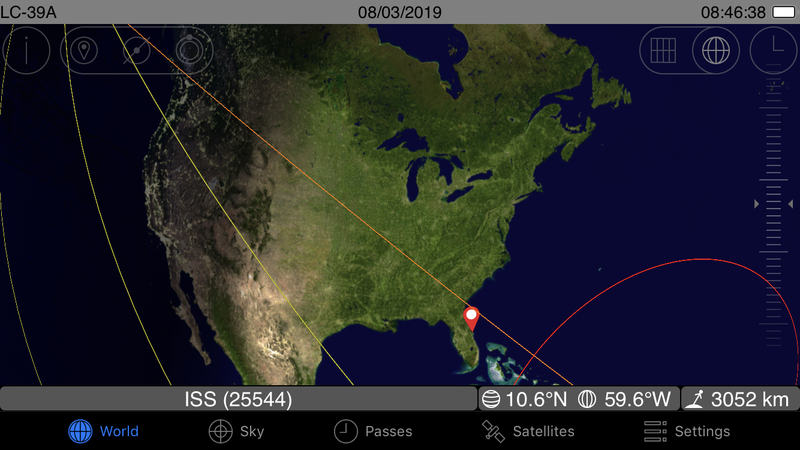 The deorbit burn ended at 08:06:24 EST (1306:24 UTC), with the burn designed to lower Crew Dragon’s perigee into Earth’s atmosphere at a specific point to allow the craft to target a precise point in the Atlantic Ocean off the northeast coast of Florida for splashdown. After ending the deorbit burn, Dragon aligned itself heatshield first. Dragon’s orbital ground track brought it through a visible pass over southern British Columbia and Alberta, Canada, and Montana in the U.S. People under this portion of the ground track, as well as those in the U.S. states of Washington, northern Oregon, Idaho, northern Utah, and western Montana had the possibility of seeing Dragon as a very faint speck of light preceding the International Space Station in the pre-dawn sky. No visible viewing will be possible from central Montana along the ground tracking southeast toward the Georgia coast. At 08:33:58 EST (1333:58 UTC), Dragon reached Entry Interface – the point at which the craft reenters the atmosphere at an altitude of 121 km or 400,000 feet. Residents in eastern Georgia, northeastern Florida and perhaps extreme southern South Carolina might have been able to see Dragon’s reentry and plasma trail. Exact position of Crew Dragon relative to the ground was unknown, and an inquiry from NASASpaceflight to NASA returned an answer that the precise ground track was still being determined at time of publication. Just 6 short minutes after Entry Interface, Crew Dragon completed reentry at 08:40:05 EST (1340:05 UTC). The drogue chutes of DM-1 Dragon’s parachute system then deployed at 08:41:22 EST, followed by the four main chutes deploying at 08:42:14 EST. Splashdown occurred in a landing zone located at roughly the same point in the Atlantic Ocean where the DM-1 Dragon’s Falcon 9 first stage landed successfully on 2 March after launching the craft on her way to the Station. Splashdown was marked at roughly 08:45 EST (1345 UTC) – with the exact, to the second splashdown time always dependent on winds. 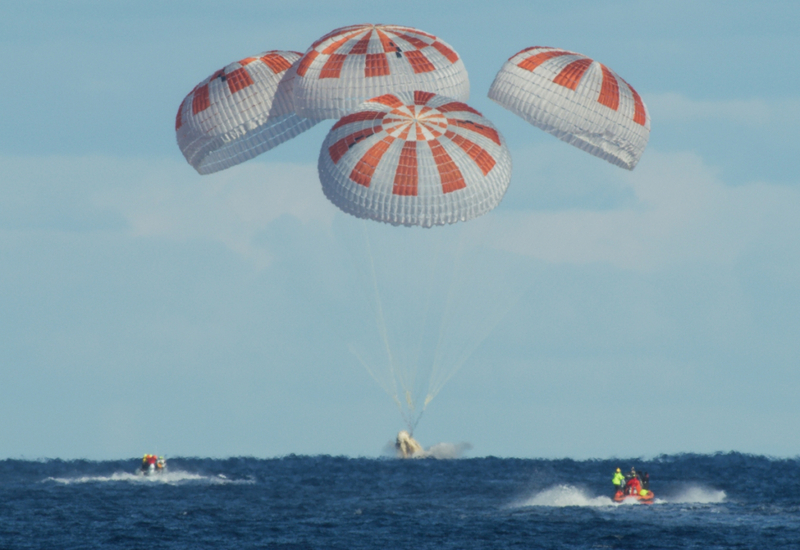 SpaceX forces immediately converged on the DM-1 Dragon for post-splashdown safing and recovery. The craft was then be taken aboard the recovery vessel and brought back to Cape Canaveral, FL, for post-flight inspections, cargo removal, and refurbishment before being hauled back to the launch pad for use in the In-Flight Abort test later this year. With DM-1 Crew Dragon safely back home, a slew of data reviews and analyses will begin by both SpaceX and NASA to verify and validate the functionality of all of Crew Dragon’s systems. The reviews are a necessary part of certifying Crew Dragon to carry astronauts to and from the International Space Station. 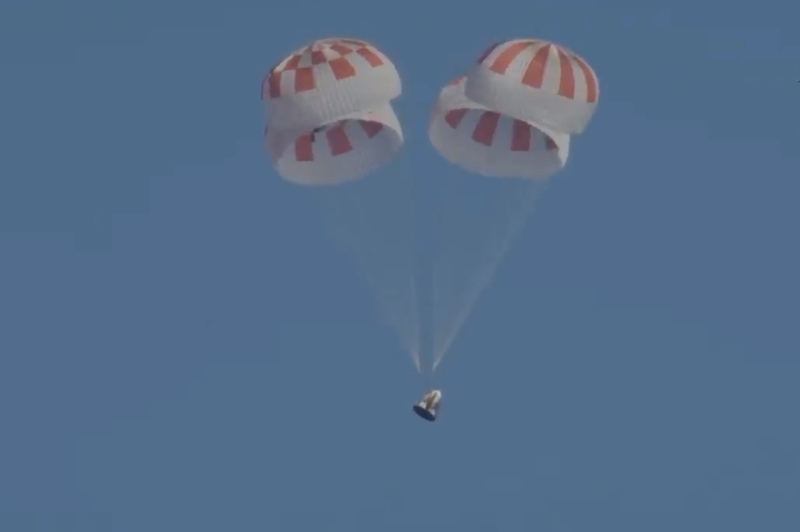 But for this particular Crew Dragon, its use as a test article for all future Crew Dragon vehicles does not end with a successful splashdown Friday morning. The DM-1 Dragon will quickly be refurbished and turned around for SpaceX’s In-Flight Abort (IFA) test, the final critical flight test before SpaceX can begin ferrying humans to Earth orbit. For this test, the DM-1 Dragon will be mounted atop a Falcon 9 rocket with an engine-less second stage and a fully functional and flight-proven first stage. The flight is expected to launch from LC-39A at the Kennedy Space Center, Florida, and last for about 60 seconds – at which the Falcon 9 and Crew Dragon will reach MaxQ: moment of maximum stress on the vehicle. 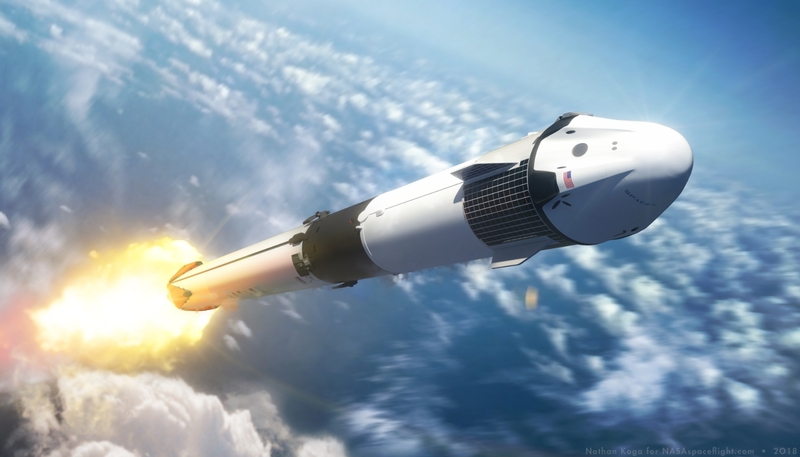 At this point, Crew Dragon’s SuperDraco thrusters will fire and propel the craft away from the Falcon 9 – testing a critical component that, while it is hoped will never be needed, is necessary to protect a crew from a potentially failing Falcon 9 rocket. Per expectations and modeling, the Falcon 9 itself is not expected to survive the abort test once Crew Dragon pulls itself away. An environmental impact report for the IFA test concluded there were no substantial environmental risks from the abort and the destroyed Falcon 9 – pieces of which will fall just offshore. It is expected that the abort will either create an unsurvivable air pressure dynamic for the Falcon 9, causing it to rupture, or that the vehicle’s Autonomous Flight Termination System (AFTS) will trigger the destruction of the rocket after it deviates from its planned flight trajectory post Dragon separation. However, the same expectations were true for Blue Origin and their New Shepard IFA test; that rocket not only survived the abort and harsh aerodynamic environment thereafter but landed successfully and was recovered. While all expectations are that the Falcon 9 first stage – core B1048.4 – will be destroyed during the IFA test, Elon Musk hedged his bet last month, stating that there was a “high likelihood” that the rocket would be destroyed – seemingly leaving open the possibility that the Falcon 9 could survive. High probability of this particular rocket getting destroyed by Dragon supersonic abort test. Otherwise, at least 20 or 30 missions for Falcon 9. Starship will take over before the F9 fleet reaches end of life. Whether or not SpaceX plans to attempt a Return To Launch Site or downrange drone ship landing on Of Course I Still Love You if the IFA booster survives the test is presently unknown. Currently, though, NASA’s Commercial Crew schedule shows the IFA test scheduled for No Earlier Than (NET) June 2019. Given natural schedule realignments and presently unknown refurbishment work that might be needed on the DM-1 Dragon to get it ready for the IFA test, it is possible and would not be surprising if the IFA test slipped from its current June target. Likewise, the current schedule lists NET July as the date for SpaceX’s DM-2 crewed demonstration flight to the ISS. 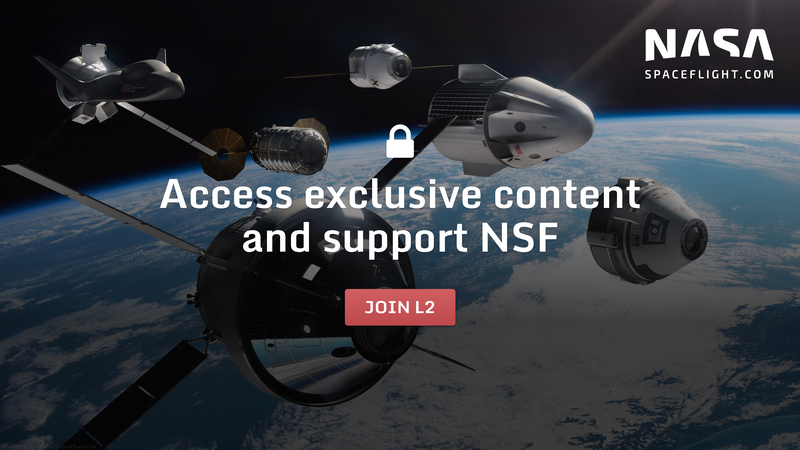 Realistically, this is not feasible given the work that still remains for that Dragon, the reviews needed following DM-1 and the IFA test, and the certification process within NASA and SpaceX to clear Dragon to carry crew. A slip of the DM-2 mission later into 2019 is not just highly likely but is expected.